The Commerce Library is located on the ground floor of Rutherford House and serves the Faculty of Commerce and Victoria Business School. There are 3 bookable study rooms on the ground floor of Rutherford House. The Commerce Library is on the ground floor of Rutherford House at the Pipitea Campus. Your University ID card is required to access bookable meeting rooms. 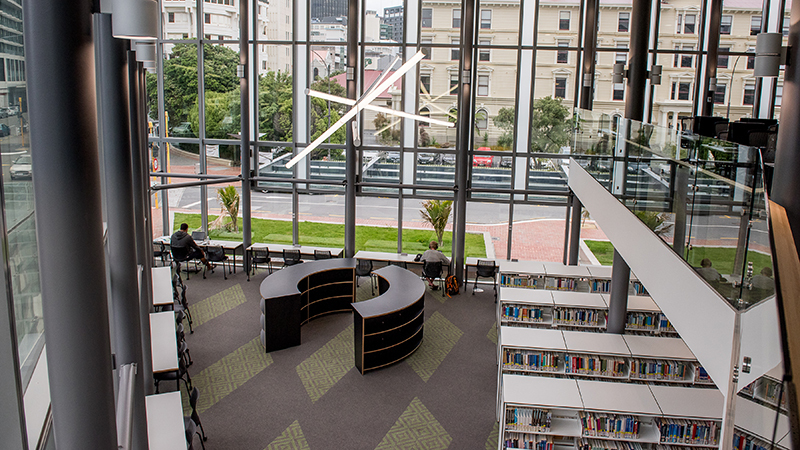 To accommodate your study needs, the Commerce Library's study spaces have been divided into two zones. Green Zones are for group work and conversation. Blue Zones are for silent, individual study. The entrance area and seating is green zoned, and the collection area and mezzanine floor computer space are blue zoned. Please respect users of library spaces and keep noise to a minimum in Blue Zones. You may bring covered drinks and cold snacks into the Commerce Library, but hot food is not permitted. The service point is adjacent to the entrance, along with a self-check machine, discovery station and express PC. A DocuPOS machine for adding credit to your account for printing and photocopying is located in the green zone, or you can add credit through the online payment system or at the service point. Group study rooms are available on the ground floor. These rooms can be booked online through the Library website. Photocopiers/printers are available in the Library and in the computer suite on the mezzanine floor directly above the Library. Student computing facilities are available on the ground and mezzanine floors of Rutherford House. The University wireless network may be accessed throughout the Commerce Library. The fastest way to get familiar with using the Library is to take a tour; you can arrange to take a tour by asking at our service point. Our Subject Librarians provide specialised support to staff and students. Contact them to arrange a one on one session. The Library holds a small open reserve collection primarily consisting of three-day loan and two-hour loan books for Victoria Business School courses. Most other Commerce material is held at the Kelburn Library. See detailed information about the Commerce Library subject locations.